Fall gardening is a very different chore, depending on where you live. 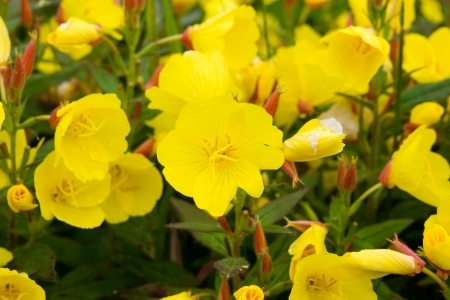 For a final splash of color this fall, consider planting evening primroses. In Los Angeles, where I live, fall is just a continuation of summer. In the Northeast, however, temperatures may start dropping quickly. But regardless of your climate, fall is the time to start preparing your garden for winter. These 10 fall gardening tips, once completed, are guaranteed to get your plants, flowers, and vegetables through the big chill ahead. If you live where you still have a few weeks left before hard frosts hit, you can still put in some flowering plants. For a final splash of color, plant dianthus, hardy asters, hardy chrysanthemum, ornamental peppers, primrose, ornamental kale, pansies, and Indian summer rudbeckia. In areas with mild, wet winters, this is a prime time to plant perennials, shrubs, and trees as well as fall veggie gardens. Clean up flower and vegetable beds. Weed. Cut back yellowing or brown foliage. When the ground freezes, plants can no longer get any moisture. So if you live in a cold climate, water lawn, plants and trees well for the next couple of months. It may be the last drink they get for a while. Cut back late-flowering perennials and shrubs such as hydrangea and buddleia. Cut peonies to the ground and mulch. Prune rambler roses now but wait until late winter or early spring to prune other varieties. Do not prune spring-flowering shrubs - such as lilacs or forsythia - whose buds have already formed. You don't mulch to keep the ground warm all winter but to keep the ground temperature uniform. When ground freezes and thaws, plants are often heaved up, exposing their roots, so you want to avoid that cycle. Mulching is essential to keeping the soil temperature uniform. In cold areas, wait till the ground is partially frozen to mulch around plants. Otherwise, the plants are lulled into thinking that it's still summer and they will keep growing. This tender new growth makes the plant very vulnerable when a hard freeze hits. It's the same reason why you don't fertilize in late fall. Mulch must be six- to eight-inches deep to keep the temperature constant. However, do not mulch more than two inches deep over tree roots as they need air and moisture. You live in a warmer clime? Mulching is still a good idea. 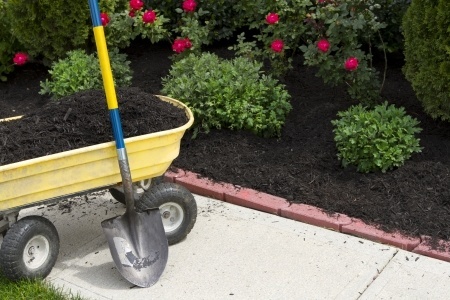 If you mulch with organic material, such as compost, your flowerbeds will self-fertilize and be ready to plant next spring. Also, a layer of mulch at least four inches deep will discourage weeds and erosion. Fertilize lawns with a slow-release nitrogen fertilizer. Water well. Reseed if necessary. Rake leaves and compost; or use for mulch. To help them decompose faster, run over them a few times with the lawn mower to chop them up. Drain and put away garden hoses that you won't be using. Clean and sharpen gardening tools. Wipe blades with a thin coating of oil. Varnish or seal wood handles. Check owner's manuals for directions on storing power tools such as lawn mowers and leaf blowers. Use trunk collars to protect fruit trees and trees with thin bark from rodents over the winter. In cold climates, dig up summer-flowering bulbs and tubers and store in a dry, cool place. Plant spring-flowering bulbs such as daffodils and tulips.